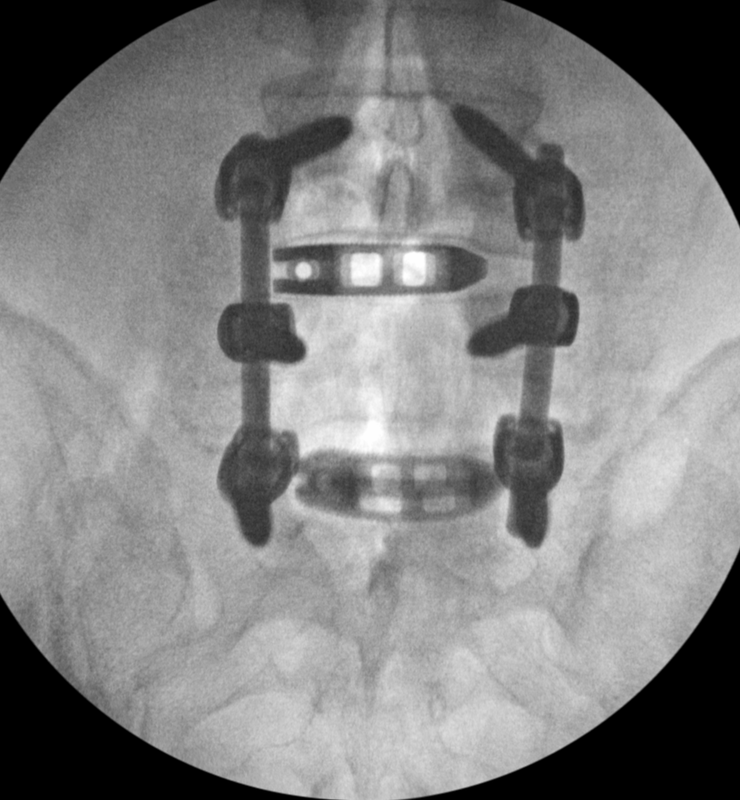 TLIF of Transforaminal Lumbar Interbody Fusion is a traditional open-surgical procedure aimed to remove pressure to the spinal nerves and provide stabilization of the spine bones (vertebrae) when there is abnormal motion between them. TLIF is one of the most common procedures used to decompress and stabilize the spine. 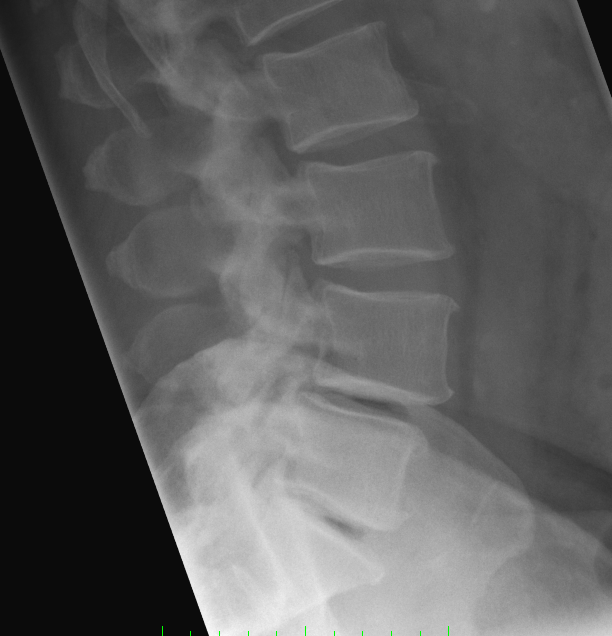 Formally speaking, TLIF is indicated in cases of spinal stenosis with instability. This means, if there is pressure on the spinal nerves and if there is an abnormal amount of movement between the spine bones (degenerative or isthmic spondylolisthesis, Figure 1). Figure 1. 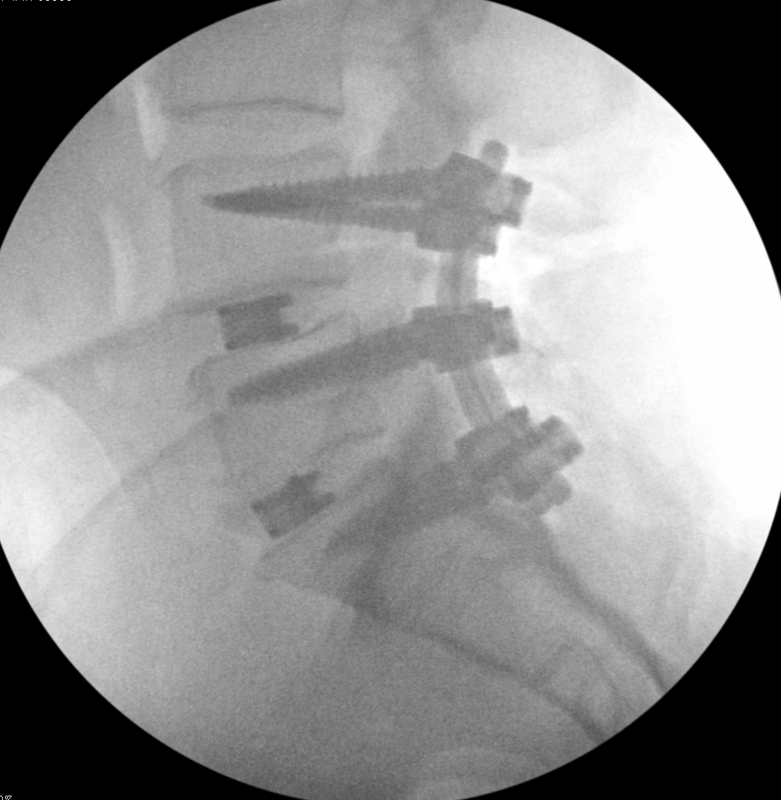 Degenerative spondylolisthesis L4-5, degenerative disc disease L5-S1. After an incision is made and the spine is exposed in the wound, the bones and ligaments that compress the nerves from the back are then removed, and spinal nerves are exposed to ensure there is no pressure on them. Next, the disc is removed and a spacer and bone graft are placed between the bones to secure them in the corrected position and then fused together, eliminating abnormal movement. Then, the screws are placed in the bones and connected with rods, securing the correct position of the bones (Figure 2). Figure 2. 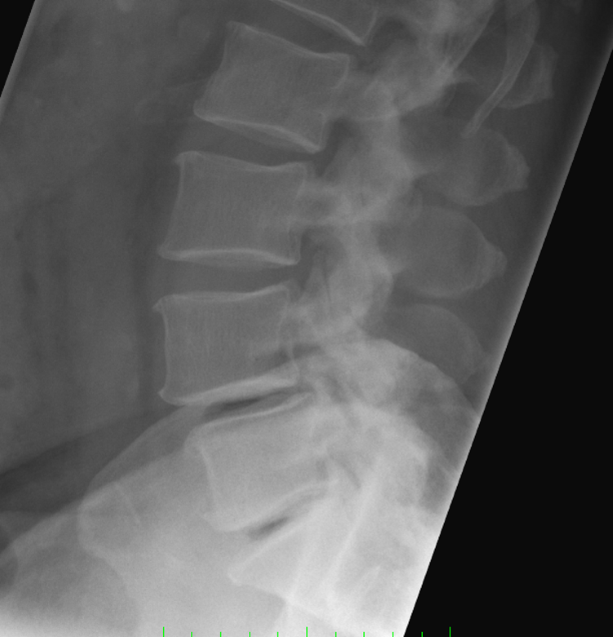 Same patient: spondylolisthesis L4-5 is reduced, bones are secured together. Are there alternatives to TLIF? What are the benefits of TLIF when compared to other procedures? Even though TLIF is more traumatic than the above surgeries, it is considered to be the most thorough procedure. It allows your surgeon to directly look at the nerves and ensure there is no pressure on them. TLIF also provides higher rates of fusion, which may determine the outcome of surgery. You need to discuss with your surgeon if the less-invasive surgeries are available in your case. What is recovery like after TLIF? Physical therapy will visit you either on the same day or the day after the surgery. They will teach you how to get out of bed safely and how to use assisting devices (a cane or a walker). You will stay in the hospital approximately one or two nights, depending on your progress with physical therapy and the amount of pain you are experiencing. How much range of motion will I loose? You may notice temporary stiffness in the back that is primarily related to muscle tightness. Range of motion in one spine segment is limited to about 5-10 degrees. Therefore, you will hardly notice any loss of motion. Most range of motion, in fact, is coming from the hip joints, not the spine itself. You can expect to have pain in the surgical area for three to five days after the procedure. Most people grade their pain around 3-5 / 10. Opioid pain medications and Tylenol are used by most people for up to two weeks. What are the risks of TLIF? Who should not have TLIF? Together with general medical contraindications to spine surgery, people with weak bone (osteoporosis) should avoid fusion procedures with instrumentation. What imaging studies will I need prior to TLIF? To determine if you need a TLIF, you will need to have a set of imaging including MRI, CT and x-rays, including long scoliosis x-ray and flection-extension x-ray views. To determine if your bones can support instrumentation, a bone density scan (DEXA) will be obtained. What should I know in preparation to surgery? Our office will communicate with you on how to prepare for the surgery. Certain medications should be discontinued, including blood thinners and drugs affecting wound healing and immunity. If there are abnormalities on the preoperative labs and studies, they may need to be corrected by your primary care provider or other specialists before we proceed with surgery.